Open until 7pm on Fridays and Saturdays from April to June and September to October. During July and August the museum is open every day from 9 am to 7 pm (9 pm of Fridays). Easter Sunday: 10 am – 6pm. Kings Day (April 27th): 11 am to 5 pm. Ascension Day: 10 and to 7 pm. Whitsuntide: 10am to 7 pm. Christmas (December 25th/26th) 10 am to 5 pm. New Year’s Day: 12 am to 6 pm. Visit before midday or after 4pm to avoid the busiest periods. We are comparing Moco Museum Banksy Experience Amsterdam Ticket Skip Line Prices from leading ticket suppliers and Try to find you Cheap tickets prices on the market. The Moco Museum is Amsterdam’s newest and coolest museum, dedicated to showcasing the works of renowned graffiti artist Banksy. Inside the traditional Dutch townhouse you can find over 90 of Banksy’s works including Girl with the Balloon, Kate Moss, Soup Can, Laugh Now, Pulp Fiction, and Kids on Guns. The museum also showcases the works of contemporary Pop Artist and art interpreter Roy Lichtenstein. The museum frequently hosts exhibitions by a variety of modern artists, previous displays have included the works of Salvador Dali, Andy Warhol and the Lasting Influence collection by Lichtenstein. From June 2018 the Moco Museum will host A Moment of Clarity by Icy and Sot. The Museum is located in the centre of Amsterdam’s Museumplein inside the beautiful Villa Alsburg. Popular with artists and art enthusiast the museum can be crowded during peak hours, however with a skip the line entry ticket you won’t have to work about waiting in line. A must see for fans of modern art. The Moco Museum showcases the very best works of Banksy as well as other contemporary artists. The museum is family friendly and suitable for people of all ages. Visiting the museum will be difficult for people with walking difficulties. Your Experience With Moco Museum Banksy Experience Amsterdam Ticket Skip Line? Find your way to one of Amsterdam’s best preserved Dutch houses. Skip the entrance line and pick up your multilingual audio guide (not included) at the entrance. See the works of the most well-known street artist in the world and admire the works of contemporary artists including Roy Lichtenstein. Take a self-guided tour of Amsterdam’s newest art museum and take your time to enjoy temporary exhibitions. What Moco Museum Banksy Experience Amsterdam Ticket Skip Line Includes? The Moco Museum and Banksy Exhibition. The Moco Museum regularly hosts temporary exhibitions. To make the most of your visit you check the Moco Museum website to see which exhibitions will be open on your chosen dates. 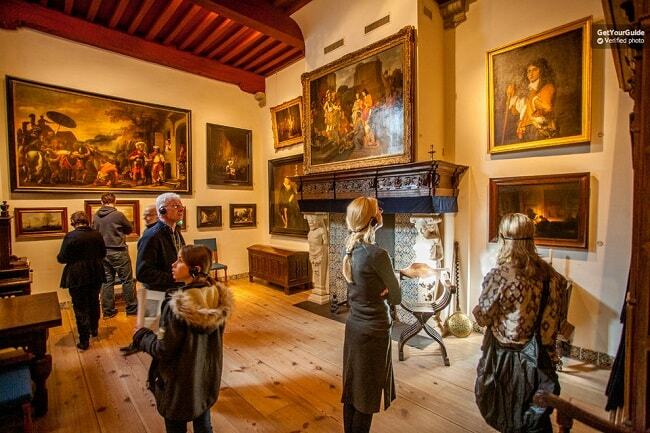 This is one of the few Amsterdam museums which is open every day of the year, if there are national holidays during your stay in Amsterdam then it’s a perfect time to visit the Moco Museum. Travelers Reviews about Moco Museum Banksy Experience Amsterdam Ticket Skip Line? The museum has a strong 4.7 out of 5-star average rating from visitors who purchased their tickets through Get Your Guide. Reviews frequently agree that the museum has fantastic exhibition. Visitors have described the artwork inside the Moco Museum as ‘thought-provoking’ and ‘inspiring’. Generally travellers agree that the skip the line, pre-booked tickets are easy to use and very convenient. The Moco Museum also has a 4.5-star rating from over 200 reviews on Tiqets and a 4.5-star rating from over 1,200 reviews on Trip Advisor. The museum is not wheelchair accessible. Visitors must be capable of ascending and descending stairs independently. Tickets will be sent to you via email. You can either print your skip the line entrance ticket or have it ready on your mobile device to show at the entrance. Cancellation policy depends on your ticket provider, Get Your Guide and Viator will allow full refunds up to a certain number of days in advance. Check their policy before purchasing your ticket. Tickets purchased from Tiqets are non-refundable. Audio guides are available for an extra charge in English, Dutch, Spanish, and Italian. The museum has a lot of stairs and does not have an elevator; therefore, it is not wheelchair accessible. Suitcases, strollers or trollies are also not permitted inside the museum. Meeting Point: Honthorststraat 20, 1071 Amsterdam, Netherlands.